Look, I like Glenngary Glen Ross as much as anyone. 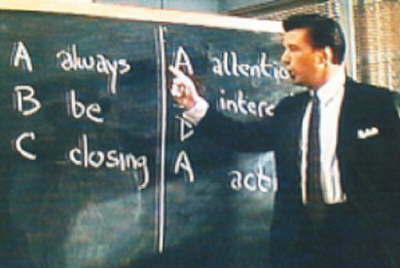 And Alec Baldwin’s famous scene where he explains that the ABCs of selling are A – Always, B – Be, C – Closing is one of my favorite scenes in any movie. Now, I understand just how difficult it is to get people to make decisions. This is true in good times, and it's especially true in difficult economic times. When I do sales training, I share the fact that decision and homicide have the same Latin root - they both mean to kill or to eliminate. Simply put, people hate to make decisions. It is the job of professional salespeople to facilitate decision-making. The goal should be to facilitate a mutually beneficial, long-term decision - not to "close the sale." The problem with the whole idea of "closing" and the idiotic idea that you're supposed to "go for the close as early as you can and as often as you can" is that it naturally creates an adversarial relationship, and even worse, causes salespeople to miss or speed through critical steps that can both shorten the sales cycle considerably and create much larger opportunities. Four years ago, I wrote an article about the myth that objections are good. The focus on closing only increases the likelihood that you'll trigger objections that diminish the selling organization. You don't facilitate decisions by closing. You do it by diagnosing, by understanding your buyers, and their critical results - better than your buyers do. You do it by being useful and creating deep, results-oriented relationships. You don't do it by trying to artificially shorten the sales process through the variety of manipulative techniques taught under the banner of "closing" or by celebrating the myth of "the closer."